The exhibit presents a quilt made in 1897-8 in Melrose. 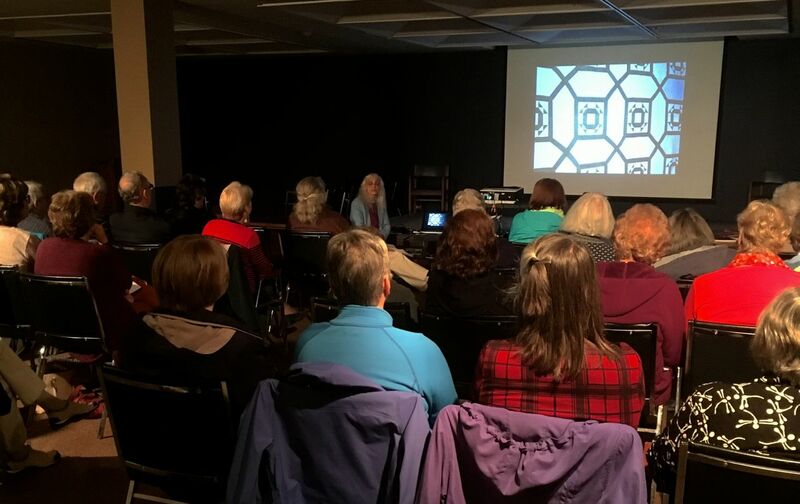 I was at all events, discussing the quilt, the research I conducted, and the history and stories I discovered. There were many associated fiber projects and presentations around the city. All lectures require a projector and screen. Guests are invited to bring quilts for discussion as time allows. 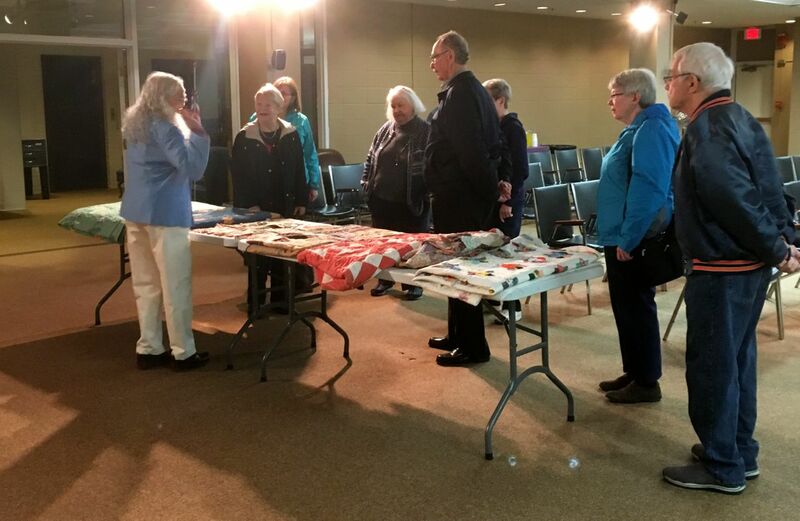 Ann will share stories from 30 years of adventures repairing quilts. There are both the family history stories embodied by the quilts she has worked on, and the stories of the thought processes and guidelines for deciding which techniques to choose. Topics include the why’s and how’s of restoration, conservation, rebuilding severely damaged quilts, and more. There will also be tales of why to decide to do nothing at all and love your quilt just the way it is. "Nineteenth Century American Quilts as Women's Art"
Historically, a woman's expression of her artistic talents were confined mostly to the home and to the needlearts in particular. This lecture explores quiltmaking in the contexts of the family, of groups of women, and of society as a whole. Since the 1970s, antique quilts have taken on a new role as they began to be hung on the wall and appreciated as art objects. The talents of anonymous quiltmakers of the past century are discussed in this context in terms of color, balance, design, etc. "How Old Is It? Dating Antique Quilts"
For most quilt collectors, knowing the ages of their quilts is very important. 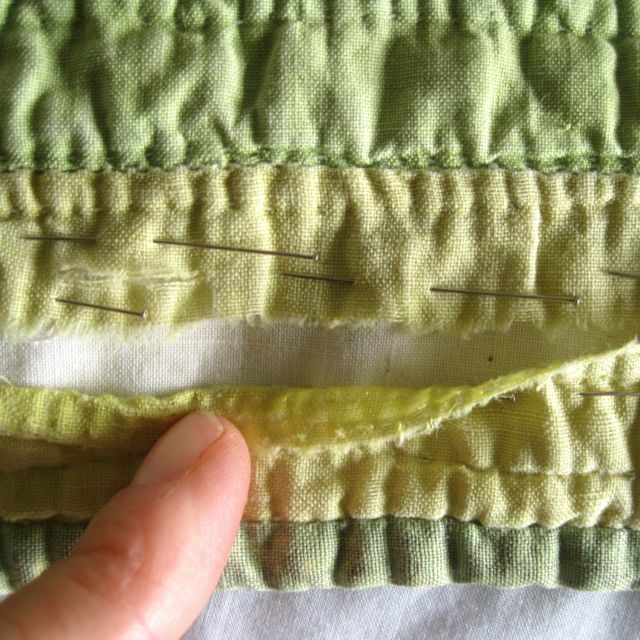 The fabrics used in a quilt hold the most direct information on age. A large part of this lecture is devoted to the history of fabrics, dyes, and printing techniques. Other factors, such as pattern, size, batting, etc., that can add to the determination of a quilt's age are also discussed. Every quilt can reveal many things about its maker, and the social and economic milieu in which she lived. This lecture takes a look at the American quilt as a window to American history. The techniques of quiltmaking were brought to this country by European settlers. These traditions were introduced to native peoples and to other cultural groups that migrated here who had no strong quiltmaking traditions of their own. This presentation explores the ways in which techniques, design sources, and function were selectively adopted and reinterpreted by these other cultural groups. Groups whose artistry is presented include the Amish, Afro-Americans, Hawaiians, Seminole, Plains, Woodland and Cuna Indians. "Art or Craft? One Quilter's Journey"
The art world distinguishes between fine art, fine craft, and craft. Quilters trying to enter the art world find themselves caught up in this discussion. I begin with an overview of the traditional place of quilts in the craft category, and the more recent appearance of quilts as art. What does it mean to be an artist? Does it really matter? I then describe the path my own quiltmaking has taken as I try to answer these questions for myself. "Construction Zone: Quilt in Progess"
Wonderful quilts do not necessarily spring forth fully formed; there is not some mystical "something" that only a few lucky people possess. Perseverance, trust, and a sense of humor are only a few of the other qualities necessary. This lecture follows the design process from original inspiration through completed art quilt. Step-by-step views show many design decisions, false-starts, and changes of direction. In preparing for this lecture, not even the photograps came out as I'd originally planned! "Quilting: An American Art Form" or "Pioneer Ladies and Their Quilts"
A short overview of American quilts. For local engagements only. I show 10 antique quilts to illustrate some basic ideas about the history and techniques of quiltmaking. A good introduction for school groups, luncheon programs, and such. "Care and Repair of Antique Quilts"
All old textiles are fragile pieces and careful thought should be given to their storage or use. The distinction between repair and conservation is an important one, and materials and techniques for both processes will be presented and demonstrated. Proper methods of cleaning, display, and storage of quilts will also be discussed. Participants are requested to bring a damaged quilt for specific instructions. This workshop requires a projector and screen. "Molas: A Look at Cuna Indian Textiles"
Molas are blouses made by Cuna Indian women from the San Blas Islands of Panama. They are recognized for their intricate and creative designs and fine workmanship. Learn about the development of the craft and then begin a mola using the reverse applique technique. 1. Beginning level, in which applique is taught. Students begin a small practice mola. More complex designs will be described and demonstrated. 2. Advanced level, in which applique experience is a prerequisite. Students begin a full-size, more complex project and, in keepimg with the traditions of mola making, have the option of creating their own design. These workshops require a projector and screen. This class is directed towards those with some quilting experience who would like to "do their own thing", but don't know how to start. We'll do some color and design exercises to help unlock creative talents. In the workshop, each student will learn how to pose a "problem" to solve in her next quilt. Various techniques of design and construction will be presented, according to each student's skill level and the qualities of the basic idea behind her quilt. Design styles can range from using traditional blocks, varying or combining traditional blocks, original block design, quilts not structured in blocks, to designing while sewing, and so on. The class will deal mainly with designs and mockups. Some students may begin sewing, but this should not be expected. The class begins and ends with each student sharing her source of inspiration and the quilt design she is developing from it. Contact me, Ann Wasserman, at annquilts@comcast.net. I will send you more complete information on scheduling, supply lists, room set-up requirements, and fees.